Published in: Dawes, C.J. & Mathieson, A.C. (1972). 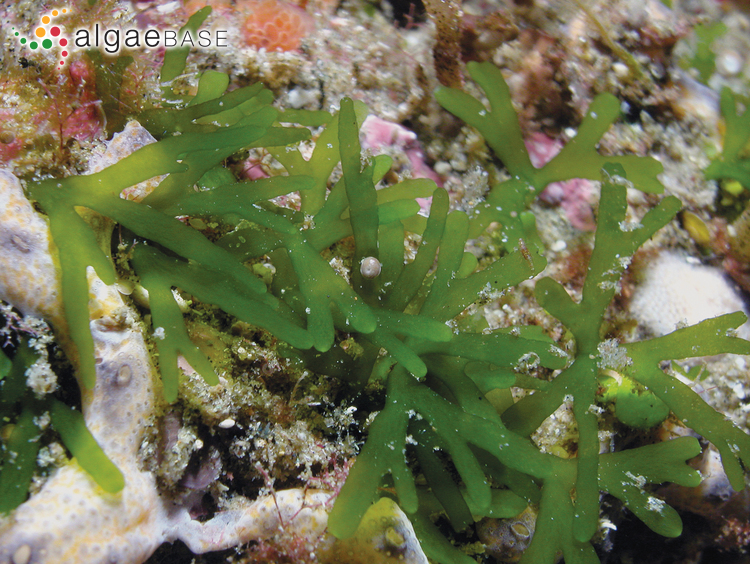 A new species of Pseudocodium (Chlorophyta, Siphonales) from the west coast of Florida. Phycologia 11: 273-277. The type species (holotype) of the genus Pseudocodium is Pseudocodium devriesii Weber Bosse. Thallus upright, to 10 cm high, anchored in sandy substratum by a well-developed tuft of rhizoids, bright green in colour; axes cylindrical, to 5 mm wide near the base, gradually attenuating toward the apices, dichotomously to somewhat irregularly branched, unconstricted; apices rounded. Thalli composed of longitudinally arranged interwoven and irregularly swollen medullary siphons, 50-110 µm wide, giving rise to a single layer of peripheral utricles; utricles polygonal in surface view, with a broadly rounded apex, distinctively broader than high in transverse section, (143-) 248-310 (-365) µm in diameter and (177-) 187-215 (-225) µm high, adhering laterally to neighbouring utricles except at the corners; utricle stipe eccentric. Chloroplasts and amyloplasts absent from utricles and confined to the medullary siphons. Reproductive structures immersed in the thallus, produced laterally from medullary siphons close to the base of the utricle stipe, spherical to ellipsoidal in shape, 80-120 µm in diameter, lacking a basal cross wall separating them from the rest of the thallus (Dawes & Mathieson 1972). Type locality: 38 nautical miles west of Egmont Key, mouth of Tampa Bay, Florida (Dawes & Mathieson 1972: 273). Holotype: C.J. Dawes No. 6280A; 1.viii.1967; dredged from 37 m. University of South Florida, Tampa (Dawes & Mathieson 1972: 273). Accesses: This record has been accessed by users 1207 times since it was created.